It is known that around the body, fat deposits contain many mature fat cells and small numbers of stem cells. These stem cells can differentiate into more fat cells, however, it is still unknown how the process is triggered. Now, a study from researchers at Stanford University identifies a hormone that controls the first step in the maturation of fat cells. The team state that their findings help explain how high-fat diets, stress and certain steroid medications cause obesity. The study is published in the journal Science Signaling. Previous studies have debunked the idea that fat cells are passive bags of calories. In addition to their storage function, mature fat cells have been shown to send and receive many hormonal signals which help regulate metabolism. The current study shows that mature fat cells make a hormone called Adamts1 that toggles the switch controlling whether nearby stem cells differentiate to begin storing fat; high-fat diets and glucocorticoid medications change Adamts1 production, telling nearby stem cells to begin maturing. The current study uses fat cells and their precursors in a dish, followed by studies in mice and humans to identify the role of Adamts1 and understand how it works. Results show that mature fat cells normally make and secrete Adamts1 in fat tissue from mice, and levels of Adamts1 drop when mice are given glucocorticoids. Data findings show that mice which are genetically engineered to make more Adamts1 than normal have smaller-than-normal fat deposits, and fewer mature fat cells. The lab state that when purified Adamts1 is added to fat stem cells in a dish, it can block glucocorticoid-induced differentiation, suggesting that it normally acts as an extracellular signal. They go on to add that once Adamts1 reaches fat stem cells, it utilises a set of intracellular signals which overlap with the cells’ glucocorticoid response pathway. Results show that a cell-signaling molecule called pleiotrophin plays an important role in this pathway, and that blocking the molecule’s signal blocks the stem cell’s entire response to Adamts1. The group then fed high-fat diets to mice and patients to examine how this affected the Adamts1 signal. As expected, it was observed that the mice became fatter after eating a high-fat diet, with new fat cells maturing mostly in the animals’ visceral fat tissue, with fat located around the internal organs. Results show that in mice, Adamts1 is decreased in this type of fat tissue; in subcutaneous fat tissue, the fat under the skin, the opposite result was seen, there was more Adamts1 production and less fat cell maturation. Data findings show that in patients who gained weight while eating a high-fat diet, the Adamts1 responses were consistent with those seen in mice. The team surmise their findings suggest that exposing adipocyte precursor cells to Adamts1 protein increases their proliferation and prevents their differentiation, and mice that over express Adamts1 in adipose tissue have smaller adipose deposits. For the future, the researchers state that their results suggest Adamts1 could be administered to prevent obesity in response to diet or glucocorticoid administration. 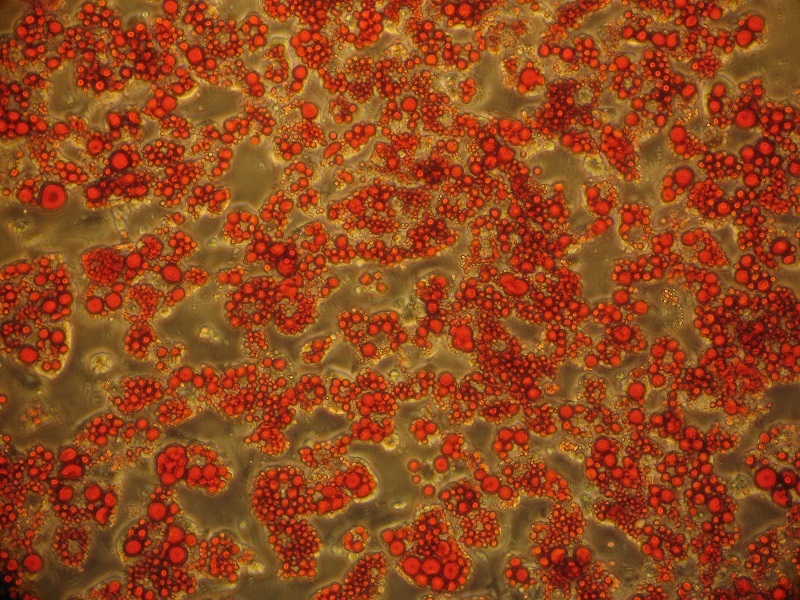 Lipid droplets (red) in adipocytes serve as main energy supply for the body. © Copyright Universität Heidelberg.